I just couldn’t resist giving you a little teaser yesterday. I’m utterly charmed by this little creation. It is a perfect shape for the flat-chested among us. Ahem. 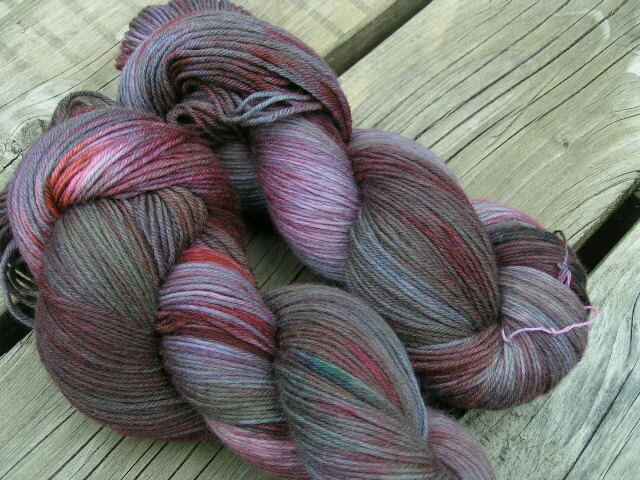 Here on Ravelry. 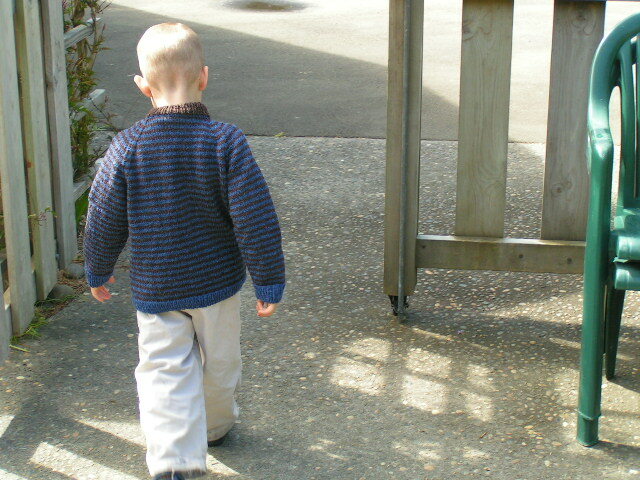 credit where credit is due – Nikolai, age 5, was my wonderful photographer today. Thanks sweetie! 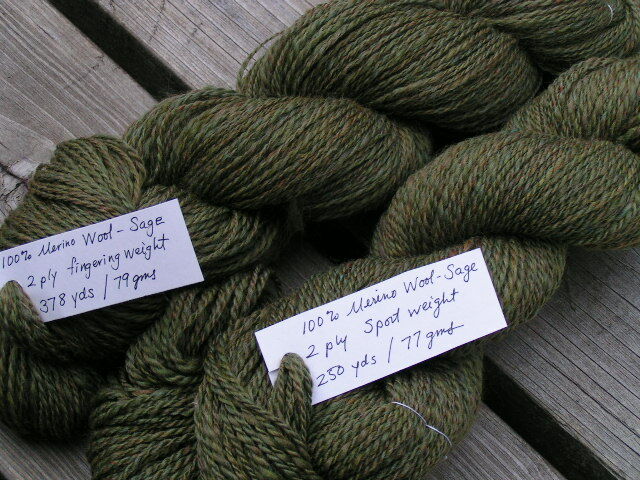 Yarn: Green Tweed is a 2-ply sport weight handspun inherited from my aunt, about 6 ounces. 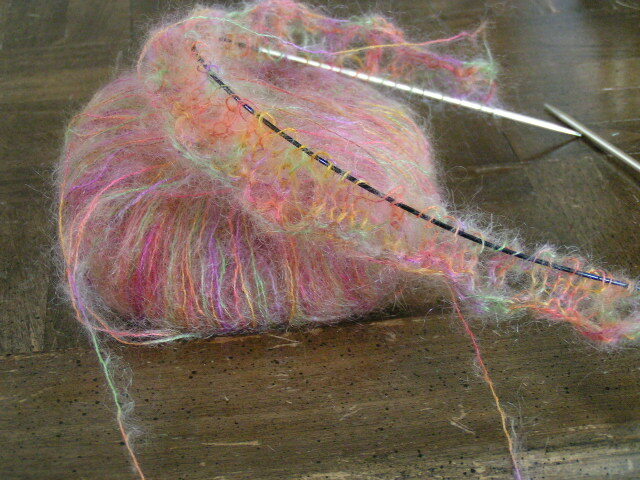 Stripes is Noro Kureyon Sock, colorway S185, less than 100 gms. 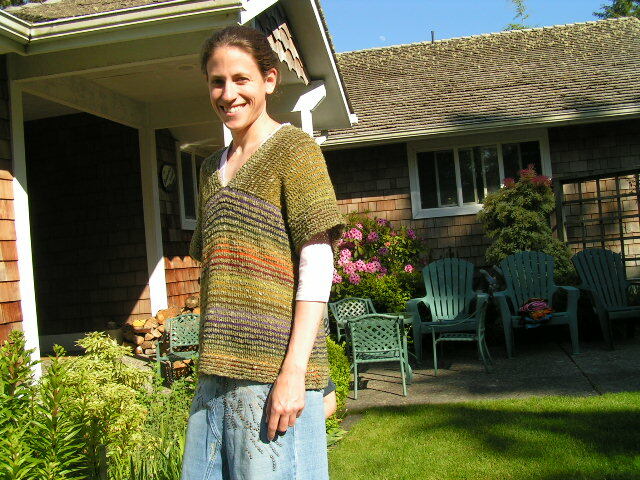 Knit entirely from stash, woo hoo! Needles and Gauge: US sz. 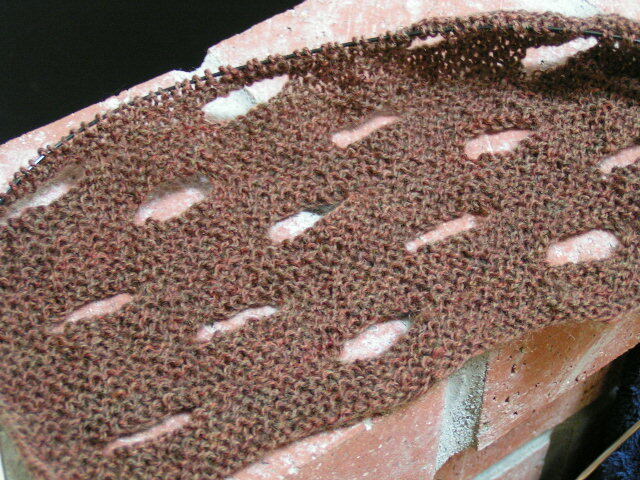 4 / 3.5 mm yielding 4.5 sts per inch after blocking and wear. 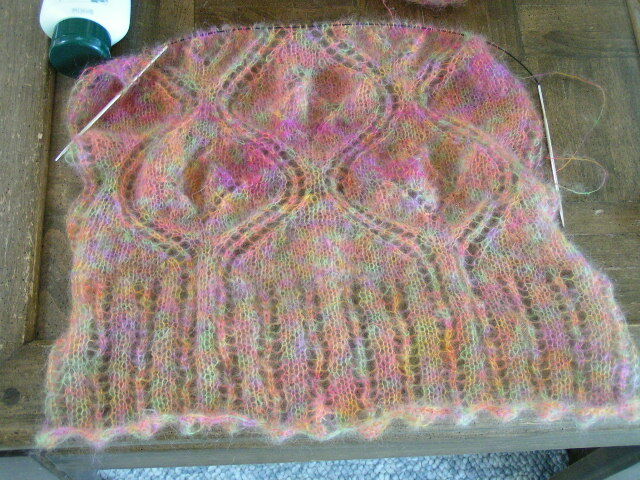 The gauge is very loose for the Kureyon sock making this very drapy. 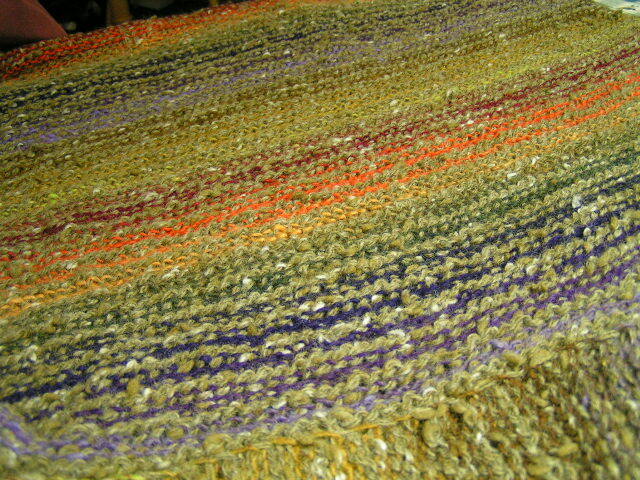 The Tweed is a much harsher/rustic yarn and it kind of holds everything together. Sizing: The chest blocked to 38″ but has stretched to about 40″ during a day’s wear. On me this is 8-9 inches of positive ease. 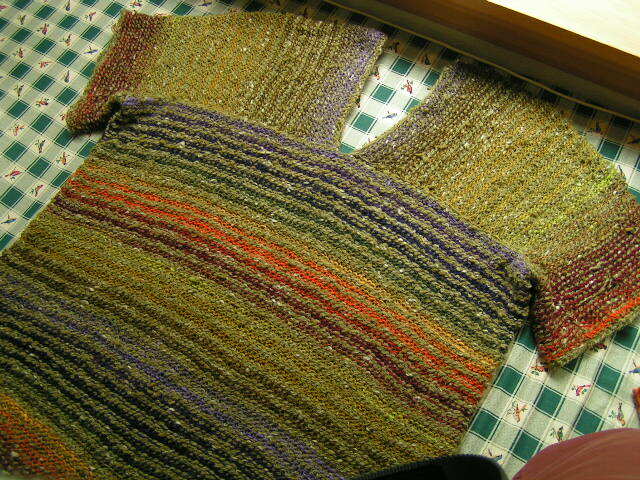 I thought I wanted long sleeves but I wasted a lot of yarn to make the sleeve stripes match. 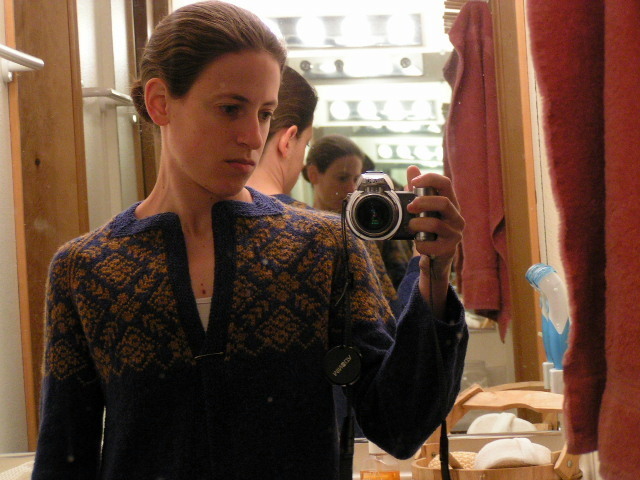 Really, the short sleeves are now my favorite thing about this sweater. It feels somewhere between kimono and Jedi… Proving once again that mistake and design can be synonymous. I thinking about putting a cute button on the back to hold it together a bit. Opinions? Guess what? It’s seamless too. 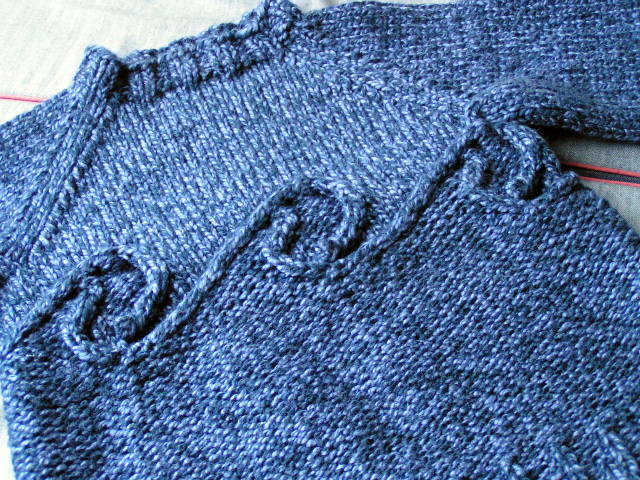 After knitting the body to the armpits I put 50% of the stitches -from center front to center back- on a piece of yarn and slowly knitted the remaining body stitches into the sleeve. Cast-on 35% at the center front, connect it to the center back like a strap, and slowly work outward using seamless saddle shoulder decreases. After about 4-5 inches start decreasing the sleeve at the top. Slowly decrease by 8%. 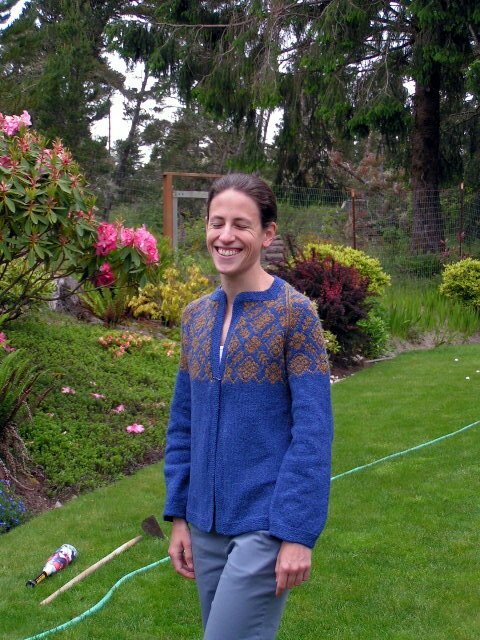 When only 8% of the body stitches remain, begin knitting around and down the the desired sleeve length. I like both sides of the fabric equally – I even wore it both ways today. I kept taking it off and turning it inside out, I can’t decided which I like better! It’s been a good couples days around here. 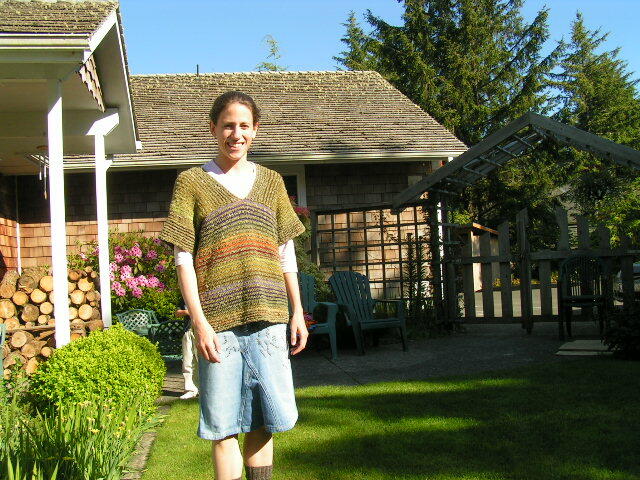 Yesterday I finished 3 knitting projects, and today it was finally nice enough to get a few pictures, including all the skirts I made a few weeks ago. It’s all on Flickr. Cheers! 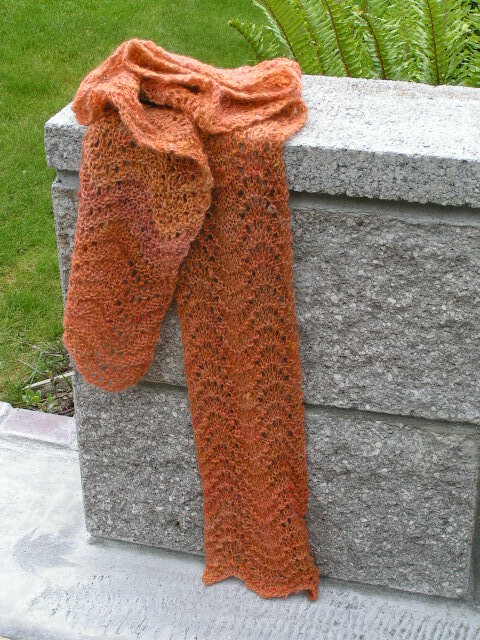 I wasn’t sure about the yarn combo – now I love it. I wasn’t sure about the style – now I love it. 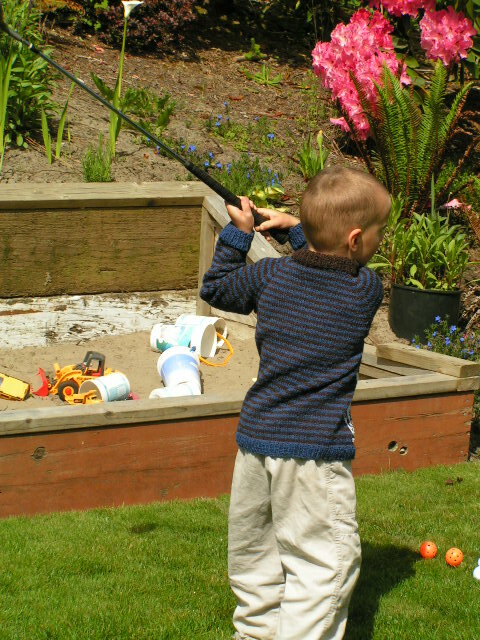 I wasn’t sure about the techniques – they worked like a charm. I wasn’t sure about the sleeves – they are charming in a Jedi sort of way. I have nothing to wear it with – but I love it anyway!! I can’t wait to show you this as soon as it’s dry! I designed this for a little boy who loves sea turtles. After designing the cables I was so charmed by the result that the turtle no longer seemed necessary! 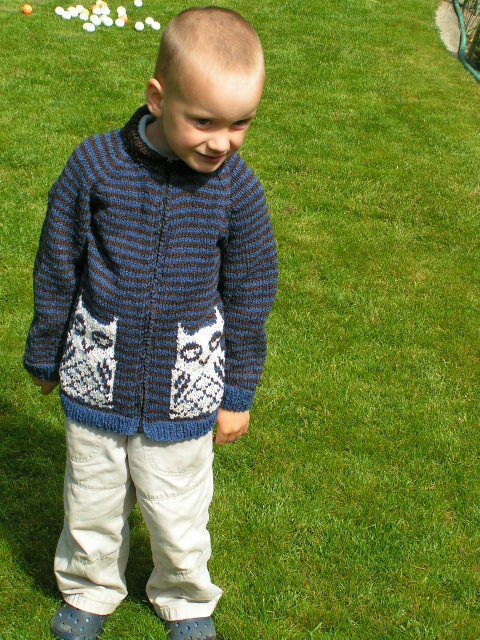 The pattern is for sale now for $5.00 through Paypal. Click the link in the right hand column to purchase the PDF. 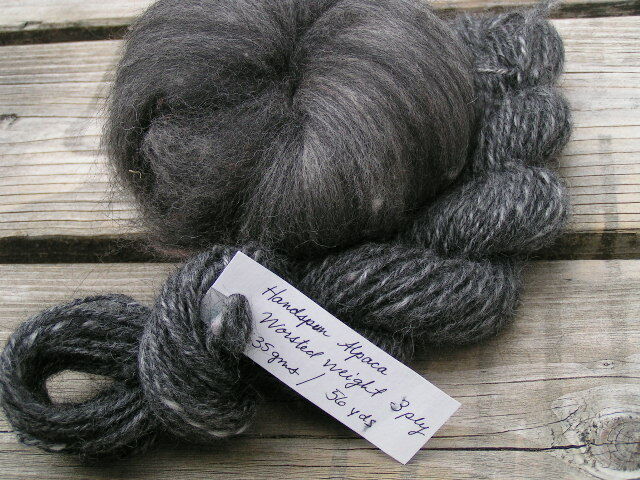 Now available to Ravelry members in my Ravelry Shop. The focus of this pattern is the cable waves chart, as lateral cables are pretty unique. 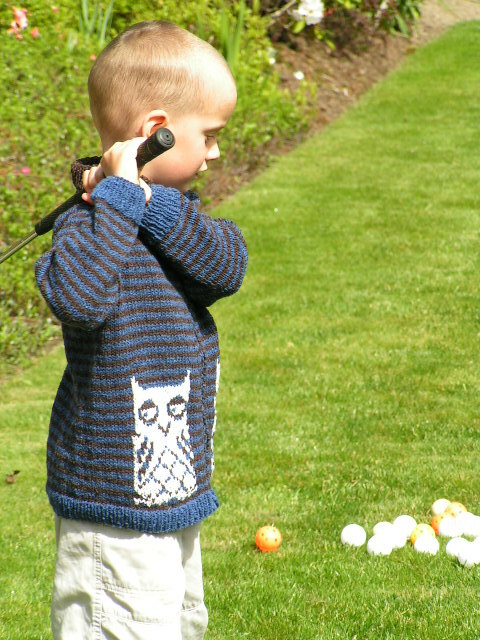 The pattern also includes basic instructions for a seamless pullover in multiple sizes and gauges- from baby to large adult.